The U.S. bank prime rate remained at 3.25 percent during the first half of August. The interest rate picture generally has gotten murkier in recent weeks, as Treasury yields halted their steep upward climb and have settled into more of an up-and-down pattern. The most significant piece of economic news so far in August typifies why rates have lacked a decisive direction of late. On August 2, the Bureau of Labor Statistics (BLS) announced that 162,000 new jobs were created in July, a figure that is down from recent months and from the average of the past year. As if to further throw cold water on economic optimism, the BLS also issued a downward revision of the job creation numbers from the previous two months. This disappointing employment report helped undermine the impression that the economy was gaining momentum. In terms of interest rates, that means uncertainty over when increased demand for capital would support higher interest rates, and also uncertainty over when the Federal Reserve would taper off from its programs to drive rates down. This is why key interest rates like Treasury yields and mortgage rates have leveled off after rising sharply from early May to early July. If the outlook for interest rates has become generally murky, it is especially muddy for credit card rates, where there are competing dynamics at work. As noted above, stronger economic demand should generally drive interest rates higher. However, an improved economy would also strengthen the financial situation of credit card customers, something that should keep credit card rates somewhat in check. In that context, it is appropriate that the sole increase in the credit card offers tracked by this survey occurred in the student credit card category - and in an upper rate tier. Given their limited credit histories and growing concerns about student loan debt, students are among most likely consumers to be subject to concerns about creditworthiness. If economic signals continue to weaken, expect rate increases to be especially prevalent in upper rate tiers, which credit card companies apply to customers with compromised credit histories. 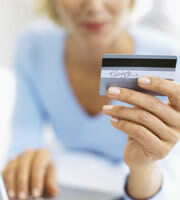 After rising in the previous survey, consumer credit card rates were unchanged in the first half of August. Student credit card rates rose by 20 basis points, to 17.62 percent, in the first half of August. That's the first change in student credit card rates since early February, and the first increase since last November. Student credit card rates on average are now at the highest level in more than two years of history tracked by this survey. With this increase occurring in an upper rate tiers, it is a demonstration of the importance of building a good credit history through responsible use of a credit card, and of the price that can be paid for credit mistakes. The good news is that this rate increase involved just one of the credit card offers tracked by this survey. That means that there is still an opportunity for students to find lower credit card rates by shopping around. Both business non-rewards and rewards credit cards were unchanged in this survey. With no change in consumer credit card rates, there was no change in the spread between rates for customers with excellent credit histories and the overall average. That spread remained at 4.10 percent. 0 Responses to "A back-to-school rise for student credit cards"